Check out what was waiting for me in the mailbox today. 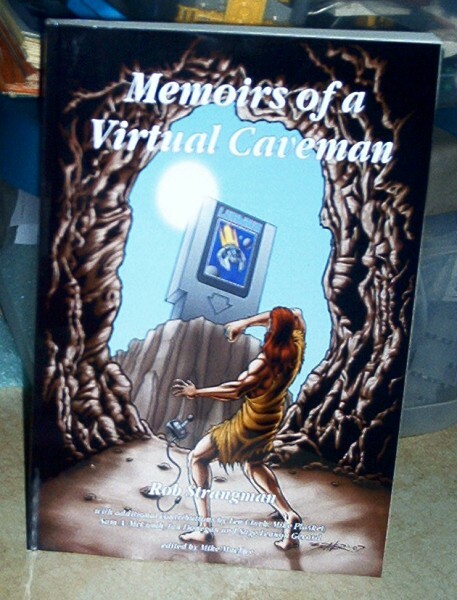 That’s right, it’s the book Memoirs of a Virtual Caveman by Rob ‘Dire51’ Strangman! It’s also the the first book cover that I’ve ever had a chance to draw, color and even letter. The cover looks a bit scrunched even though I thought I had the recommended cover dimensions right. The worst part is how the crystal-clear printing process drops dime on how I went all lazyhouse on the giant game cart’s cover. The shame! I plan to start reading this one Sunday night and I’m sure that the video game lore within will put a smile on my face. The stories are from that rare breed of gamers who love play mechanics and techniques more than graphics and random techno soundtracks but don’t get annoyingly pretentious about it. There’s even a chapter about Rob’s OPCFG site, a place that talked about old-school gaming before it was cool and inspired me to try and make something more out of ScrollBoss. I’ll ramble some more about this book after I’m done reading it. I still think the cover pic is a phenomenal piece of work. ;) Odd that you think it looks scrunched, though, considering it had to be stretched to fit the dimensions of the cover (still not sure why…). Hey Rob! It’s hard to predict how sites will automatically resize pictures, but it doesn’t look too bad. I just have to gripe about something whenever I post my artwork! Ah, I get it. LOL Let me know what you think when you’re done!